Manufacturer of a wide range of products which include waterproofing admixtures. Owing to our rich industry experience and acquaintance, we are affianced in offering a wide range of Waterproofing Admixtures that strengthen the concrete by sealing of cracks; the offered waterproofing admixture is processed with the best grade ingredients and leading technology according to the quality standards. 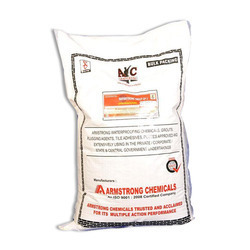 This waterproofing admixture is available in various customized packaging options. Looking for Crystallization Water Proofing ?